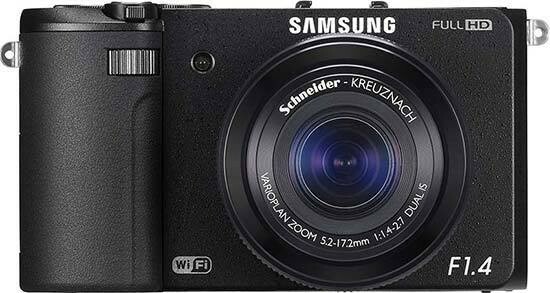 The Samsung EX2F is a solid upgrade of the EX1, but 2 years is a long time in the world of digital cameras and the EX2F doesn't quite offer enough to keep up with the competition, despite featuring the world's fastest lens on any compact. Indeed, it's that super-fast lens that inadvertently brings one of the camera's key handling flaws to light. Using the wide-open F.1/4 aperture in bright sunlight inevitably causes the image to be over-exposed - the new ND filter is on hand to solve that problem, but it quickly becomes annoying having to dip into the Function menu to toggle it on and off (at least 5 button presses are required to do so). Samsung have also seen fit to relegate the ISO speed to the same sub-menu, again slowing down the operation of the camera. Coupled with lacklustre performance when shooting RAW and a more general inability to customise the camera controls to suit your way of working, it makes the Samsung EX2 more frustrating to use than its key rivals. Image quality is very good for a compact, thanks to the larger than usual CCD sensor and the sharp and bright 24-80mm lens. While some people will find the 3.3x zoom limiting, it does help to ensure that the picture quality remains at a high level throughout the focal range, with little distortion, chromatic aberrations or even noise until you use ISO 800 or faster. Recent rivals have delivered better image quality though, in particular the smaller Sony Cyber-shot RX100 with it's even larger sensor, so while the EX2F succeeds in modestly increasing the megapixel count without any detrimental effects, it can't quite match the competition. Samsung have addressed two of the key criticisms that we levelled at its predecessor, namely a lack of burst shooting mode and very limited video recording options, with the EX2F capable of shooting 10fps and full 1080p movies with stereo sound. Even these improvements are a little short of other cameras, though, with the burst shooting only possible when shotting JPEGs and a lack of creative control over exposure when shooting a movie.